“Exploring Crete” is Peter Sommer Travels’ first scheduled tour in 2017. This year, to give an impression of the experience, we are providing a diary of sorts on our blog. Rather than describing every day in detail (you can check our itineraries on www.petersommer.com for that) every day we will pick one image we took that day, accompanied by some explanations and thoughts. Today was another foray into diverse histories. In the morning, we made our way into the foothills of Crete’s mountainous spine, to the site of Eleutherna (or Eleftherna), an important Greek city-state with beginnings in the Early Iron Age. The local museum, opened only a year ago, contains superb and rich golden treasures from princely (and princessly) tombs of the 8th century BC. The finds show early evidence of long-distance contacts with Egypt and the Levant, and perhaps especially with the early traders we now know as Phoenicians. The site itself is a place of bucolic beauty, with cobbled paths among olive trees, bee-buzzing meadows, steep scarps offering grand views towards the sea, goats ignoring the visitors, looking for the spring flowers that occupy what space they can. After lunch, we returned to Rethymno, first to view its brand-new (provisional) archaeological museum, then to explore the town’s Venetian heritage. Rethymno is one of the best-preserved Venetian cities of the Mediterranean, with many fine Venetian houses (distinguished by characteristic stone-carved doorways), palazzos (we’re staying in one of them), fountains, churches and so on, all on the original Venetian street-plan and with an Ottoman stratum added. The same applies to the superb Fortezza, the Venetian fortress overlooking Rethymno from a low rise near its small harbour. It is a wonderful example of a fortification from the the early era of firearms. Unlike the Venetian defences of Chania and Heraklion itself, it did not enclose the whole city, but stood separate from it – and it still does. 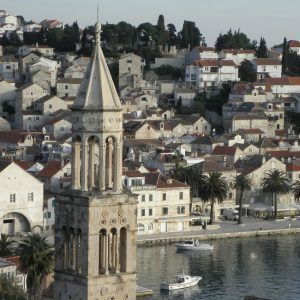 It was constructed roughly from 1573 to 1580, the plan being by Michele Sanmicheli, the prime Venetian military architect – we also meet him elsewhere in Crete, in the Greek Mainland and in Croatia! In spite of the effort made, Rethymno fell to the Ottomans barely three generations later, in 1646. 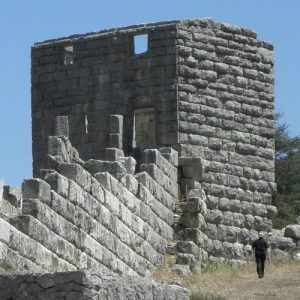 What we now see is an irregular fortification, answering to the difficult terrain and employing various defensive features of its era, such as heart-shaped bastions, flèches, and a ravelin (used by the Ottoman Turks as a prison and by modern Greece until recently as the archaeological museum: I worked in its magazines, counting potsherds, for many summers) – it’s a great place to explain and demonstrate the principles of defensive architecture. The fortress itself was restored by the Ottomans after their conquest, and the domed turret on our image is part of that phase. 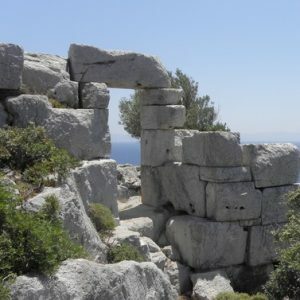 Some scholars speculate that the acropolis of the ancient city-state of Rithymna was in the same location, but there is no clear evidence for this.